The biggest sell board game in history is the game of Monopoly. Monopoly has been on the market for over sixty years and has sold more than 200 million copies all over the world. It has been estimated that more than 500 million people have played the game. The longest game of monopoly lasted for 1 680 hours. The longest game of monopoly in a bathtub went on for 99 hours. Monopoly records also include monopoly played upside down 36 hours, in a tree house 286 hours and underground 100 hours. Parker Brothers started making Monopoly in 1935. There have been more than 200 million games sold around the world. Monopoly is printed in 37 different languages and is available in 103 different countries. The cartoon man on the box is actually named Mr. Monopoly. He used to be called Uncle Rich Pennybags. The policeman on the board is Officer Malloy. Officer Malloy is the one responsible for sending Jailbird Jake to prison. The game was invented by Charles Darrow. Charles was born on August 10th 1889. Charles, invented the game after he had lost his job as a domestic heater salesman during the depression. He became the very first millionaire game inventor. The game was first sold in Wanamaker’s Department Store in 1934. If you were to total all the money in a game, you would get $15 140. In 1970 a Braille version of the famous game was produced. The most expensive game ever made was created by Alfred Dunhill. He used real gold and silver houses and hotels in his version of the game. A chocolate version of the game was sold by Neiman Marcus for $600 in 1978. When first approached by inventor Charles Darrow in 1934, Parker Brothers rejected the game saying it had 52 fundamental flaws. The complexity and the length of the game were two of its biggest failings. The properties on the original game board were named after places in Atlantic City. In 1972 a proposal was made to change the names of Mediterranean and Baltic Avenue in Atlantic City. The proposal was met by an outcry from monopoly players and fans. The plan was scrapped. 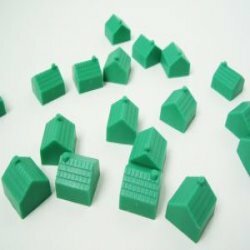 A standard game includes, 32 green houses, 12 red hotels and two dice. There are 22 properties, four railways and two public works cards. Fidel Castro ordered that all the games of monopoly be destroyed when he took power in Cuba. Parker Brothers has also created hundreds of special edition monopoly games. You can get games that are center around a county, a city, a sport or even a movie. Students attending Juniate College turned part of their campus into a giant game of monopoly. They used walkie talkies to communicate as they moved about the board on bicycles after rolling giant foam dice. This entry was posted in Game & Hobby Trivia and tagged Monopoly facts trivia, Monopoly game, Monopoly Game Trivia, monopoly trivia by Jane. Bookmark the permalink.